Recently, in the mail—the actual, material, non-electronic post—I received two books about Johnson in languages I do not understand. Fortunately, both contain enough material in English for me to make out their subjects. The first is a work in Chinese by an occasional contributor to the JNL, Tian Ming Cai. 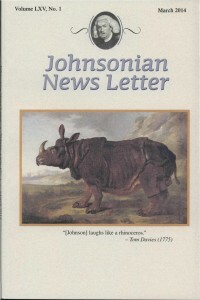 An appended table of contents in English, and a note from John Byrne (who acted as intermediary in sending the book), shows that the work includes translations of the Life of Savage and the Life of Cowley with some appendices: “A General View of Johnson Study Abroad” and “My Trip to Johnson’s Hometown: Lichfield.” Readers of the JNL may have seen previews of these works in recent issues (LXIV, 2 [September 2013] and LXI, 1 [March 2010]). Of course, being incapable of reading this book, I have little to say, but I note the somewhat surprising choice of “Cowley” to accompany “Savage.” I applaud the choice because the Life of Cowley is one of my favorites, and Johnson evidently thought it the best of his Lives because of the essay on the metaphysical poets (Boswell’s Life, IV.38). Perhaps “Cowley” and “Savage” are the best of the Lives and that’s the plain and simple answer to the question of why they were chosen. The book was published in 2013 in Beijing by the International Culture Publishing Company. Given China’s skyrocketing economy and our nation’s, as well as the world’s, “pivot to the Pacific,” it is hard not to reflect that these books are further evidence of the growing importance of eastern Asia in all aspects of human life. The cornerstone of the western literary tradition, Virgil’s Aeneid, concerns a translatio imperii, a translation of empire westward from Troy, in Asia, to the shores of Italy. Later writers tracked the course of empire as it went further west to England and then to America. In the wake of empire—or at its side—went the muses. (Adam Potkay writes very engagingly about this westward movement in the forthcoming Blackwell Companion to British Literature, volume 3). Americans are used to a further westering that locates the cutting edge of our culture on the shores of the Pacific, somewhere between Haight-Ashbury and Hollywood. Now it would appear that empire and the muses have gone so far west that they are again in the east. Having visited China last summer, I can report that the cities of Beijing and Shanghai are bigger, newer, more populous, and more frenetic than London, New York, or Los Angeles. Our hero once remarked that “the full tide of human life is at Charing Cross.” In later times Americans may justly have located that tide in Times Square, but now we have to confess that the full tide of human life is on the Bund in Shanghai. Looking across the Huang-po River to the impossible verticalities of Pudang, one can at least be happy that Johnson has a foothold there—a good old-fashioned, paper-and-ink foothold.